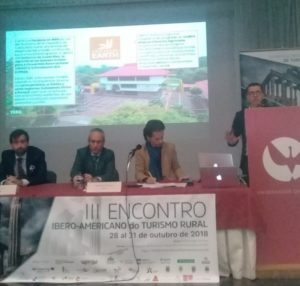 The third Ibero-American Meeting on Rural Tourism (officially Encuentro Iberoamericano de Turismo Rural) took place in both Portugal and Spain from October 28 to 31. Christopher Picado, coordinator of EARTH University’s Educational Tourism Unit, represented the University. Organized by Estrategia Iberoamericana de Turismo Rural, the annual gathering encourages the sharing of new perspectives, best practices and emerging trends on contributing to rural community development through high-quality, sustainable tourism ventures that meet travelers’ demands. At the conference, Picado gave a talk about EARTH’s work helping to commercialize local rural tourism projects in Costa Rica. He exchanged thoughts and opinions with representatives of various universities – Universidad de Évora (Portugal), Universidad de la Corhuila (Colombia) and Escuela Superior de Hostelería y Agroturismo de Extremadura (Spain) – on how to harness the cooperative power of institutions to promote rural tourism throughout Ibero-America. EARTH’s Educational Tourism Unit provides hands-on learning experiences that integrate ecological, agricultural, scientific, sociocultural and entrepreneurial components. These open-air, informal and customizable lessons allow learners to gain new knowledge while engaging with other cultures, languages and environmental sustainability. The Unit offers programming for businesses and students – high school or university, Costa Rican or foreign.